In botany in reference to leaves, the term deciduous refers to a tree, shrub, or other plant that completely loses its foliage for part of the year. This may be a species in temperate and Arctic zones whose leaves fall at the end of the growing season due to the onset of winter, or a tropical or semi-tropical species whose foliage does not remain for more than one annual cycle, perhaps due to a seasonal variation in rainfall. Deciduous in this sense contrasts with evergreen, which refers to a plant having foliage that persists throughout the year. In a broader botanical sense, deciduous refers to the seasonal or periodic shedding of a plant structure, either leaves at the end of a growing season (Seiberling 2005), or a structure such as petals after flowering, or fruit when ripe. In an even broader sense, deciduous, which in general means "falling off at maturity" or "tending to fall off," refers to the dropping of a part that is no longer needed, or falling away after its purpose is finished. In plants, the falling away is the result of natural processes; in other fields, the word has a similar meaning, such as deciduous antlers in deer or deciduous teeth, also known as baby teeth, in some mammals, including human children (Gause 1955). The term is derived from the Latin word decidere, meaning "to fall off" (Harper 2001). This article will be focused on the term in the botanical sense of foliage. There are many different types of deciduous plants, including trees, shrubs, and herbaceous perennials; species of flowering plants, conifers, and ginkgos; and plants with broadleaf, needlelike, or other leaf types. 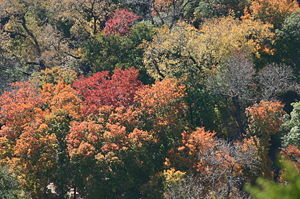 Having their leaves fall under certain conditions (especially the onset of winter or the arrival of the dry season) confers certain advantages to deciduous trees, such as conservation of water, but it also adds to the diversity and wonder of nature for humans, including the beautiful fall foliage seen in temperate climates. Deciduous forest in autumn, prior to leaf fall. In botany and horticulture, evergreen refers to a tree, shrub, or other plant having foliage that persists throughout the year. This terminology includes both cold-tolerant species in temperate and Arctic zones whose foliage remains throughout the winter and into the next growing season, and also tropical and semi-tropical plants whose foliage remains for more than one annual cycle. In the Glossary of Botanical Terms, evergreen is defined as "bearing green leaves through the winter and into the next growing season" and as "persisting two or more growing seasons" (Seiberling 2005). Although the term evergreen often is used as if synonymous with the cone-bearing conifers (division Pinophyta), particularly those with needle-like leaves, evergreen includes all types of plants, with many broad-leafed flowering plants having foliage that persists throughout the year in tropical and semi-tropical areas, while some conifers are not evergreen, but deciduous, such as the larch (genus Larix) with its needle-like leaves. The converse of evergreen is deciduous. In botany and horticulture, deciduous plants are those trees, shrubs, and herbaceous perennials that lose all of their leaves for part of the year. This process of leaf loss is called abscission. In temperate and polar climates, leaf loss usually coincides with winter. In other climate zones, such as tropical, sub-tropical, and arid regions, plants may lose their leaves during the dry season or during other seasonal variations in rainfall. Semi-deciduous and semi-evergreen are botanical categories intermediate between deciduous and evergreen. Semi-deciduous plants lose their old foliage as new growth begins; that is, they lose their foliage for a very short period, when old leaves fall off and new foliage growth is starting. This phenomenon occurs in tropical and sub-tropical woody species, for example in Mimosa bimucronata. Semi-deciduous may also describe mild-weather trees that lose leaves in a manner similar to deciduous trees in an especially cold autumn. Semi-evergreen plants lose most of their leaves before the next growing season, but retain some of them during winter or during dry periods (Weber 2001). Seiberling (2005) defines semi-evergreen as "bearing green leaves into or through the winter, but dropping them by the beginning of the next growing season; tardily deciduous or winter deciduous." Some trees, including a few oak species retain desiccated leaves through winter; these dry persistent leaves are called marcescent leaves and are dropped in the spring as new growth begins. Leaf drop or abscission involves complex physiological signals and changes within plants. The foundation for leaf drop is laid during the period of active new growth in the spring when an abscission layer is formed between the leaf petiole and the stem. The abscission layer comprises sub-layers of cells that can separate from each other because they are sensitive to the plant hormone auxin and it can be produced at differential rates by the leaf and the body of the plant. When the auxin production by the leaf is consistent with the auxin production from the body of the plant, the cells in the adjoining cell sub-layers of the abscission layer remain connected. In the fall or when under stress, the leaf's auxin production decreases causing a reduction in cellular elongation on the leaf side of the abscission layer. The difference in the elongation rates of cells in opposite sub-layers within the abscission layer causes a break in the connection between the two cell sub-layers, allowing the leaf to break away from the plant. At the same time the cells in the sub-layer remaining on the plant body side of the abscission layer form a seal so the plant does not lose sap (Srivastava 2002). A number of deciduous plants remove nitrogen and carbon from the leaves before they are shed and store the nitrogen and carbon in the form of proteins in the vacuoles of parenchyma cells in the roots and the inner bark. In the spring, these proteins are used as a nitrogen source during the growth of new leaves or flowers (Srivastava 2002). Changes in pigment concentration are also part of the physiological changes. The process of photosynthesis steadily degrades the supply of chlorophylls in foliage. Plants normally replenish chlorophylls during the summer months. When days grow short and nights are cool in temperate and Arctic environments, or when plants are drought stressed, deciduous trees decrease chlorophyll pigment production. For some species in cooler climates, this allows other pigments present in the leaf to become apparent, resulting in fall colors. These other pigments include carotenoids, which are yellow, brown, and orange. Anthocyanin pigments, which produce red and purple colors in the fall foliage, are not always present in the leaves; they are produced in the foliage in late summer when sugars are trapped in the leaves after the process of abscission begins. Parts of the world that have showy displays of bright fall colors are limited to locations where days become short and nights are cool. In other parts of the world, the leaves of deciduous trees simply fall off without turning the bright colors produced from the accumulation of anthocyanin pigments. Plants with deciduous foliage have both advantages and disadvantages compared to plants with evergreen foliage. Deciduous plants lose their leaves to conserve water or to better survive winter weather conditions, but they must regrow new foliage during the next suitable growing season. This uses more resources, which evergreens do not need to expend. Evergreens suffer greater water loss during the winter and they also can experience greater predation pressure, especially when small. Losing leaves in winter may reduce damage from insects; repairing leaves and keeping them functional may be more costly than just losing and regrowing them (Labandeira et al. 1994). Many deciduous plants flower during the period when they are leafless as this increases the effectiveness of pollination. The absence of leaves improves wind transmission of pollen for wind-pollinated plants, and increases the visibility of the flowers to insects in insect-pollinated plants. This strategy is not without risks, as the flowers can be damaged by frost or, in dry season regions, result in water stress on the plant. 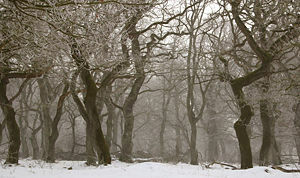 Nevertheless, there is much less branch and trunk breakage from glaze ice storms when leafless, and plants can reduce water loss due to the reduction in availability of liquid water during the cold winter days (Lemon 1961). In areas where there is a reason for being deciduous (for example, a cold season or dry season), being evergreen is usually an adaptation to low nutrient levels. Deciduous trees lose nutrients whenever they lose their leaves, and to build new leaves they must replenish from the soil whatever of the nutrients they have not been able to store over the winter as storage proteins. When few nutrients are available, evergreen plants have an advantage. In warmer areas, species such as some pines and cypresses grow on poor soils and disturbed ground. In Rhododendron, a genus with many broadleaf evergreens, several species grow in mature forests but are usually found on highly acidic soil where the nutrients are less available to plants. In taiga or boreal forests, it is too cold for the organic matter in the soil to decay rapidly, so the nutrients in the soil are less easily available to plants, thus favoring evergreens. In temperate climates, evergreens can reinforce their own survival through evergreen leaf and needle litter contributing to a higher soil acidity and lower soil nitrogen content, or the shelter of existing evergreen plants making it easier for other evergreen plants to survive cold and/or drought (Aerts 1995). The deciduous characteristic has developed repeatedly among woody plants. Trees include maple, many oaks, elm, aspen, and birch, among others, as well as a number of coniferous genera, such as larch and Metasequoia. Deciduous shrubs include honeysuckle, poison oak, and many others. Most temperate woody vines are also deciduous, including grapes, poison ivy, virginia creeper, wisteria, and so forth. Periods of leaf fall often coincide with seasons: winter in the case of cool-climate plants or the dry-season in the case of tropical plants (Cundall 2005). However, there are no deciduous species among tree-like monocotyledonous plants, such as palms, yuccas, and dracenas. Forests with a majority of tree species that lose their foliage at the end of the typical growing season are called deciduous forests. Deciduous forests can be found in sections of North America, South America, Europe, Asia, Australia, and Africa. These forests have distinctive ecosystems, understory growth, and soil dynamics (Röhrig adn Ulrich 1991). 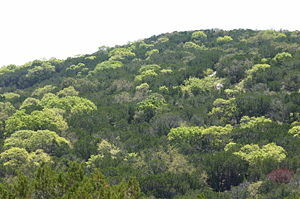 Temperate deciduous forest biomes are plant communities distributed in America, Asia, and Europe. The have formed under climatic conditions that have great seasonable temperature variability with growth occurring during warm summers and leaf drop in fall and dormancy during cold winters. These seasonally distinctive communities have diverse life forms that are impacted greatly by the seasonality of their climate, mainly temperature and precipitation rates. These varying and regionally different ecological conditions produce distinctive forest plant communities in different regions. Tropical and subtropical deciduous forest biomes have developed in response not to seasonal temperature variations but to seasonal rainfall patterns. During prolonged dry periods, the foliage is dropped to conserve water and prevent death from drought. Leaf drop is not seasonally dependent as it is in temperate climates, and can occur any time of year and varies by region of the world. Even within a small local area there can be variations in the timing and duration of leaf drop; different sides of the same mountain and areas that have high water tables or areas along streams and rivers can produce a patchwork of leafy and none leaf trees (Bullock and Soli_Magallanes 1990). Bullock, S. H., and J. A. Solis-Magallanes. 1990. Phenology of canopy trees of a tropical deciduous forest in Mexico. Biotropica 22(1): 22–35. Cundall, P. 2005. Flora: The Gardener’s Bible: Over 20,000 Plants. Ultimo, NSW, Australia: ABC Publishing. ISBN 073331094X. Ewers, F. W., and R. Schmid. 1981. Longevity of needle fascicles of Pinus longaeva (Bristlecone pine) and other North American pines. Oecologia 51: 107–115. Gause, J. T. 1955. The Complete Word Hunter. New York: Crowell. Harper, D. 2001. Deciduous. Online Etymology Dictionary. Retrieved May 23, 2008. Labandeira, C. C., D. L. Dilcher, D.R. Davis, and D. L. Wagner. 1994. Ninety-seven million years of angiosperm-insect association: paleobiological insights into the meaning of coevolution. Proceedings of the National Academy of Sciences of the United States of America 91(25): 12278-12282. Retrieved May 23, 2008. Lemon, P. C. 1961. Forest ecology of ice storms. Bulletin of the Torrey Botanical Club 88(21). Röhrig, E., and B. Ulrich (eds.). 1991. Ecosystems of the World, 7: Temperate Deciduous Forests. Amsterdam: Elsevier. ISBN 0444885994. Seiberling, S. M. 2005. Glossary of botanical terms used in the OpenKey Project. The Illinois—North Carolina Collaborative Environment for Botanical Resources. Retrieved May 23, 2008. Srivastava, L. M. 2002. Plant Growth and Development. Hormones and Environment. Amsterdam: Academic Press. ISBN 012660570X. This page was last modified on 17 September 2008, at 22:29.